Hello Caliathletics fam! Welcome to another brand new article! Today we are going to talk about stretching, we will try to provide you with an exhaustive content starting from its definition going all the way through which are the different types of stretching that you can learn, develop and adapt to your daily routines. When we think about stretching, we usually match this term with the action of trying to make our muscles more elastic and flexible by keeping them for a short/medium time range (seconds) in a position of stress that leads them to go beyond their usual length (i.e. stretch). As you can see, the definition above, is just one of many that you can find as it doesn’t exist a specific common one. By keeping in mind such definition, now we can go more in depth of when stretching should be performed and when not, how to approach a stretching movement and how many techniques are existing. As we also mentioned in some of our previous articles, the best moments in which you should go for a good stretching session are mainly after your workouts and in rest days between them. Why do I say that?! On my personal experience acquired until now, I noticed how stretching affects in very positive way my overall physical condition if done after every workout and in rest days where I can completely dedicate to a wider range of movements thanks to the more time available to dedicate to that. I can seriously tell you that, whenever happened to me and still happens sometimes, to leave the gym or the park without a proper stretching session done after my workouts, I always felt like overcharged of stress in my muscles and tendons. You can notice that only if you listen carefully to the signs your body is giving you after you have put it for an hour and half or so under continuous stress due to the nature of the workouts. You’ll feel a sense of breathlessness due to the fact that, without taking at least 30 minutes of your time to relax the muscles and tendons through an accurate breathing technique that involves your diaphragm, they won’t be able to gain flexibility because you left them overcharged only of the tensions accumulated during the workout. So, my personal suggestion is, try to dedicate at least 30 or more minutes after every workout, to breathe with your diaphragm and at the same time extend your muscles through flexibility and stretching. If you keep breathing with your nose and mouth, yes you can still be able to stretch them, but I assure you not in the same way as if you were involving more the diaphragm in order to do so (once again principle tested personally throughout the years). Another very important moment that can be dedicated to a good and accurate stretching and flexibility session is surely represented by the rest days. If for instance you train three times a week say Monday, Wednesday and Friday, the best would be to include a separate session of stretching in the two days that you will rest from the workouts, hence Tuesday and Thursday (be aware that also Saturday and Sunday are eligible for such sessions). In this way, you will be able to distribute in proper way the workload (workout and stretching) without taking risks of overtraining and overstretching. In the rest days, you will be able to concentrate more on a “head to toe” (as I like to call it) stretching routine, where you will be able to involve all the muscles starting indeed from your head, all the way down to your toes. In this way, you can then include time to time new different exercises so that your muscles and tendons will be able to adapt to a wider range of movements and won’t be restricted only to a specific range of some. I personally do change the combination and the type of exercises periodically, in order to increase the flexibility and the ROM for that same muscle, muscle group by hitting it in different ways. Talking about the time range, like I said before, after every workout it would be best to dedicate at least 30 minutes to stretch and relax. When it comes to the rest days instead, since you will be able to dedicate the whole time for that, I highly recommend you to start with at least 1 hour with the goal to aim to 1 hour and a half or more depending on how many exercises you wanna include in your session. Personally, it takes me 1 hour and a half and sometimes more, to perform all stretching movements in accurate form, by concentrating also on the breathing technique (we will discuss further about it in one of our next articles). A last word must be spent to emphasize fact that stretching must not be performed in such accurate way before your workouts. Since are existing different techniques, the only one that in my opinion can bring positive results before the workouts, is the static active stretching. Static active stretching is a form of stretching meant to increase the flexibility, but by means of movements that are putting in motion that specific muscle or muscle group and at the same time aiming to increase its flexibility. In the next paragraphs, I will show you few exercises of this kind that can be applied before your workouts. When you are going to approach a stretching exercise, you must always question yourself and wonder if that specific exercise is good or bad for your health. Whenever you hear from someone that an exercise is better than another, or that a specific stretch is bad for you, do not rely in 100% on such things. Firstly, try always to analyze yourself and in particular your body and keep in mind if you had some injuries in the past or if you still have some aches and pains around your body for whose not all stretching exercises could be healthy to perform. As you all know, and if you don’t know I’ll tell you right now, not all stretching exercises can be good for you as they can be good only for someone else. This means that, if you have for instance a pain in your lower back, not all stretching exercises that are involving such area of your back can help to relieve the pain. You must be well aware of fact that, whenever you feel a muscle-related pain in a specific area of your body, it doesn’t necessarily mean that the pain is exactly located in that area. To make a clear example, if for instance, you have a pain in your neck and you cannot rotate it comfortably in 360 degrees, it can be that the pain is due to a contraction located instead somewhere near your traps or also near or inside your shoulder blades. In this case, you should consider approaching a different way to relieve the pain throughout a solution that involves other kind of stretching movements that are helping indirectly to achieve this goal. So all the stretching exercises that are aiming to stretch the shoulders, shoulder blades and traps as well could be a good combination to feel relief in your neck. The same can be told for the lower back, when I found out to have an herniated disk in L5-S1, I lately found out also a couple of exercises that were actually acting mainly on glutes, hamstrings and quadriceps femoris. Since then, I never stopped to practice those exercises and to include them in my routines; the relief I felt since then it has been always getting better and better within my rehab process. This for me was a clear example of how often the muscular pain generated in a specific area of the body, can be caused by a contraction located in a muscle or group of muscles that are reflecting on it. An important fact that I didn’t mention before, and that for sure now is going to be emphasized is the one related to the proper warm up prior to whichever stretching session you are going into. Before, I underlined how a good and exhaustive stretching session can be performed in rest days, so this means that prior to it you didn’t practice any dynamic activity; well I didn’t surely mean that you have to go straight into a stretching movement before having warmed up properly the muscles in the whole body. Is the same principle as for the workouts; we emphasized how, in order to reduce or avoid injuries in the best way, it is mandatory to warm up by raising the body temperature. Well, same principle applies before going into a stretching session, as muscles, tendons and ligaments need firstly to get loose in order to stretch them properly. Like we said, a warm up implies to raise the body temperature while increasing also a bit your breathe, but not until the point to have breathlessness. I say that because, as we all learn from our mistkaes, I personally noticed that whenever I tried to do an HIIT or Tabata workout and immediately after going into a short stretching session, all my muscles were out of oxygen and trying to stretch them at that time was very counterproductive. HOW MANY STRETCHING TECHNIQUES (TYPES) ARE EXISTING?! Whenever you hear talking about stretching, you probably immediately think about those few typical positions (often performed on the floor) well known worldwide that are implying to hold them for a variable amount of seconds in order to have the muscles stretched. Well, in the next pages we are going to enlist all the main techniques of stretching that are actually many more than just those few exercises you have always well known, hoping to provide you with an exhaustive guide that will help you to increase your flexibility significantly. Static Stretching: the most common way of stretching a muscle or group of muscles by starting from a relaxed position of both antagonist and agonist muscles. The stretching movement starts when, from the relaxed position, you are going to apply slowly more tension on the muscle or muscle group and by holding that position for a certain amount of time (usually seconds). Following up the stretching movement, comes then the release phase where instead you should always go back to the starting relaxed position progressively in order to not hurt the muscle or group of muscles just stretched. It is perfect for sedentary people and, in general, for all those who are beginners (and not only as every type of stretching brings different overall benefits). The most typical example of such type is the one where you sit on the floor in an L position where your legs as well as your back are straight. The stretching movement implies then to progressively bend over and try to reach the tip of your feet with your hands by keeping always your back in line and not bent. In this way your hamstrings, calves and lower back are under tension for a specific time range that can go from 20 seconds (minimum time range required to start to feel the muscles lengthen). Passive Stretching: as the name says, this type of stretching implies the help of a second person who can actually assists the one performing the stretching movement in order to be able to apply a greater tension. Due to the nature of this kind of help, the person who assists the one performing the movement must be very careful while applying the tension on the interested muscles in order to have the best effects. An apparatus solid and stable can be used as well in order to provide a more intense tension on the muscles for instance, if in your local gym or park you have a pole or whichever kind of support that allows you to lay on it your hand, arm or leg then a bigger tension can be applied. Active Stretching: this type of stretching is very useful and can be actually included in between the regular exercises that are part of your workouts, to help activate your body before going deeper into the workouts. It can also be used apart, as it is a form of stretching that focuses on applying tension on the muscle or group of muscles targeted without any assistance nor support. In particular, among the most common types of active stretching exercises we can have the one where you lay in a starting supinated position on the floor with legs straight and arms wide open on both sides. By rotating one leg at a time in the opposite direction of where it was laying, you stretch the hips as well as the lower back and as you can see, you actually stretch such parts by performing a dynamic movement. Another dynamic stretching movement can be the one that focuses on your shoulders and in particular, the one where you have your arms wide open on both sides, this time starting from a standing position (on feet). By rotating the arms firstly clockwise and then counterclockwise, you will actually stretch and activate the rotator’s cuff, again by performing a dynamic movement. P.N.F. 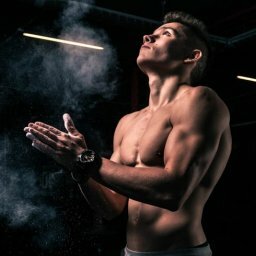 (Proprioceptive Neuromuscular Facilitation): since a couple of years ago, when I firstly read and heard about this advanced stretching technique while attending the course for becoming national calisthenics trainer, I immediately felt it like a very interesting one. After learning how this advanced technique applies on the body, I tried it out on myself in order to see which positive effects could bring compared to the other types. Well, the result after a while of practice was astonishing and I can assure you that, for all those who are already quite familiar with the other stretching techniques above, this one is a must to learn. In detail, this technique works by involving at the same time the antagonist and the agonist muscles in a sequence that can be divided in two phases, one of contraction and one of stretching (relaxation). What is an agonist muscle?! An agonist muscle is the one that contracts in order to let a movement happen in our body. For instance, the most common example of agonist muscle can be the bicep that, through its contraction, allows the elbow to flex. What is an antagonist muscle?! An antagonist muscle is the one instead that relaxes while the other one contracts, so taking again the example above, while the bicep contracts, the tricep (antagonist muscle) relaxes. This means that, if you choose for instance as targeted muscles the hamstrings, the initial tension will be applied on the quads (agonist muscles) for 10 seconds before releasing slowly and holding the new position achieved. After a short break, you can repeat once again the contraction of the agonist muscle for other 10 seconds and then release and reach a new position. It is very important that, whenever you release from the tension and a new position is reached (because of the relaxation of the agonist muscles), such position must be held, in order to be able then, to increase the flexibility and reach always a farther point of stretch. Such technique requires a lot of practice since it’s not easy to apply on yourselves; you need firstly to comprehend how breath affects it. When the contracting phase starts, you are supposed to put under tension the agonist (or antagonist) muscle for 10 seconds and at the same time, you must also hold your breath by actually contracting your core while exhaling. Once a new point of stretch is reached, you must hold it by relaxing the muscles and then, after a while, start again with another contracting phase of agonist muscle, followed by another relaxing phase of the antagonist ones. This stretching technique can be performed either on your own or with the help of a partner. Usually, with the partner is possible to test your actual level of flexibility in your hamstrings and lower back for instance. Lay on the floor in supinated position (back on the floor), lift up one leg and fully extend it with no tensions, then your partner must slowly push it towards your chest by applying the force in your toe. In the meantime that the force is applied, you are supposed to breathe and relax in order to let the tension slightly decrease, increasing at the same time the ROM of your hamstrings. After reaching a new point of stretch compared to the initial one and after taking of course a moment of rest, your partner should then apply once again the force in your toe aiming to push farther the leg and take it closer to your chest. Keep in mind that there are also other ways to apply this technique as you can do the same as explained above, also with one leg at a time. It is very important to emphasize which can be the proper moment when to practice with this technique. Surely, you must avoid using the P.N.F. straight after a leg workout or HIIT/Tabata training since the legs will be still loaded with tensions from the past exercises just completed in the first case. In the second one, with cardio workouts, muscles will be out of oxygen not allowing a proper relaxation as well as a proper stretch because of this lack. Best would be to practice in a separate moment far from the workouts or either combine the PNF with other stretching techniques at the same time (that is what I usually do in order to cover multiple flexibility patterns at the same time). A small bracket is worth opening, regarding a variant form of PNF that can be very useful to increase in fast way the flexibility of a targeted muscle or group of muscles. The pro of such technique compared to the PNF basic one, is the reciprocal inhibition. This means that by using this kind of method, you will “cheat” your CNS (Central Nervous System) by slowly increasing the range of movement with an alternate contraction and relaxation of the agonist and antagonist muscles or muscle groups. In poor words, with the alternate contraction and relaxation of both agonist/antagonist muscles, you will let the nervous system believe that the new point reached with the prolonged contraction, is not anymore dangerous for the health of the muscle. Consequently, once you relax and apply a new contracting force, it will allow you to go farther and reach a new point of stretch. Also in this case, be aware that the way you breathe using your diaphragm is very important if not, I’d say, fundamental. Isometric stretching: this form of stretching basically differs from the previous ones above, because of the fact that it focuses mainly on holding a position of stretch that targets a specific muscle (or group of muscles) for a longer period of time compared to PNF. Due to the nature of this technique, is worth saying that it is not surely recommended for all kind of bodies, in particular it has to be avoided from all those people who are in a growing phase i.e. children and adolescents who are in the process of growing up in height. One of the most common examples of isometric stretching exercise is: the calf stretch. In this exercise, your body as well as your hands are facing the wall or whichever solid surface; place one leg forward in a slightly bent position while the other one is straightened in the back. The contraction phase starts when you slowly apply pressure on the front heel while pushing your hips, as well as your leg straightened, forward. The stretch is felt mainly in the calf and the position should be held for at least 20 to 30 seconds. Dynamic stretching: this form of stretching implies to repeat multiple times a swinging or (soft) bouncing movement very slowly, so that the muscle targeted is able to reach its maximum ROM. By doing so, such swinging/bouncing movement should progressively increase and allow the targeted muscle to increase as well its flexibility. Be aware that the movement must be executed always under control. Will you provide video to explain how to do a perfect stretching ? Please check my answer I gave to guys below and you’ll get sll the info you need. My biggest apologies to you too for my very late reply! “If you’ve been hanging around for a while you might have noticed that my full-body mobility/stretching/yoga program is now available on the website and you can purchase it! A full body mobility video and full body stretch routine for calisthenics would be the best thing ever!!!!! that would be amazing !!!! My biggest apologies for my very late reply! Well, if you’ve been hanging around for a while you might have noticed that my full-body mobility/stretching/yoga program is now available on the website and you can purchase it! So feel free to check it out and you can use the code mattia10 in order to get 10% discount out of the price.